Metal chassis. Rectangular tube frame with wire support surface, flat steel reinforcing strips. Container structure made of square tube frame with wire mesh, bolted and riveted. Door with metal hinges. Opening angle 270º. Keeps everything together. The versatile and compact solution for group luggage – with generously dimensioned case storage area and practical coat rail. 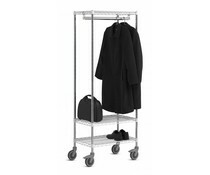 This professional transport solution assists personnel in moving guests to a different room and coping with a sudden guest relocation quickly and conveniently. Robust, dimensionally-stable and manoeuvrable design made entirely from plastic. Good protection on all sides for crockery transport, high load capacity.